If I type in my username and password it works. But the Window will come up at the next start. Does anyone know a solution for this? I tried many things out in the Java Settings but non helped, as it worked with the old Java Client. Can I give mabye more Information? Addendum: The JAVA Authentication Window only appears if we use SSO. Nico, is the only change you did updating the Java version on the client or did you update anything on the Ivy Engine side as well? What version of the Engine are you using? I see you are using 32-bit JRE version. Have you tried the 64-bit version? Yes, when I use the 64-bit Version the same Error appears. Can you share your authentication provider settings? https://developer.axonivy.com/doc/latest/EngineGuideHtml/integration.html#integration-single_sign_on Do you have Windows+BasicAuth or only Windows auth? Is negotiation enabled or strictly enforced NTLM? With jre8_201 Oracle introduced (without mentioning it in the release notes, thanks very much!) a new authentication parameter (as security property) jdk.http.ntlm.transparentAuth in the JRE configuration file <jre_home>/lib/net.properties. It also sets the default value to disabled (other possible values are allHosts and trustedHosts), therefore completely disabling transparent authentication on Windows. The obvious one is to change the setting in the net.properties file to allHosts (former default) or trustedHosts (a better recommendation). 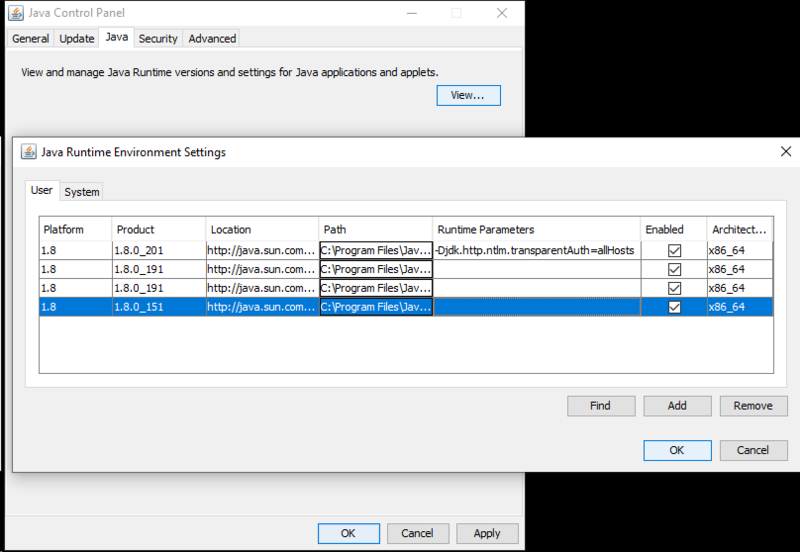 The less obvious solution is to configure your jre8_201 runtime in the Java Control Panel in the Java tab -> View... Here you can add e.g. -Djdk.http.ntlm.transparentAuth=trustedHosts to the Runtime Parameters section. Note that these are only client side solutions. I haven't found a solution to override this behavior from the server (in the JNLP file). I am not even sure if we can do that as this is a security property and there are more restrictions on setting them than normal system properties.